KITT Romania launches the new division focused on customizing tuning products and adapt them to each client needs or desire. In our vision each car must be unique and based on this philosophy we try to create exclusive products such as headlights with customized lightning systems. Our first project was customizing one set of BMW 645i Headlights, our idea was to create a surprising contrast, so we placed red led markers into headlights. Led markers are meant to change the color of the Corona Rings (angel eyes) by dispersing light into a fiberglass ring. This system was developed by BMW in 1998 and the first model equipped witht this system was BMW E39 M5. The basic idea was to create unique headlights for a special car, so we just start working on this project, first we wanted to add a touch of fierce looking by adding red angel eyes to the headlights. The hard part of the project was finding a way to reach the inner side of the headlight, after some researches we find out that the headlights can be opened by applying heat on the hermetically sealing between the headlight body and the glass. We managed to open the headlights by keeping 20 minutes in an oven that heated the sealing at 248 degrees Fahrenheit. 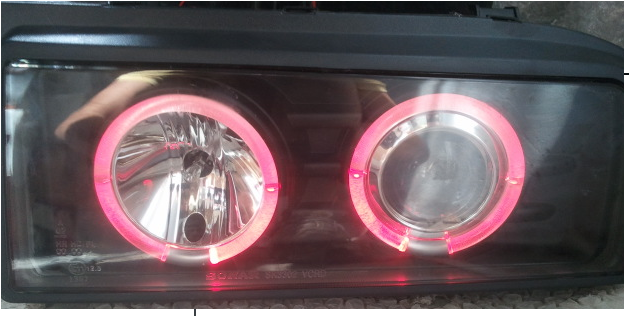 Next step was changing the pale yellowish color of the Corona Rings (angel eyes) with pure red light. So we obtained a massive effect, this effect was created by the contrast between black headlights with bright red light. Our second and most complicated project was to create a biphasic HID (xenon) headlights with biphasic DRL. The idea was to create the best headlights with improved lightning system. First we took one set of headlights for Skoda Octavia and inspect them in order to find a biphasic lens that can be fitted in. After some researching work we finally found the perfect match. After we managed to fit and start the biphasic lens another idea appeared, why not creating a day time running light system? First the headlights were equipped with day line LED but our idea was to improve that system so we customized the inner side of the headlights so we can fit much powerful LEDs. After we accomplished this task we added a module that light at full capacity the LEDs when the engine is running and diminuate power of the the LEDs t by 30% when headlights are on. Due to the biphasic lens the passing light is just astonishing, when the passing light is activated both phases are working, the xenon lens rises their beam and the halogen passing light activates and create a long beam which increases the visibility. 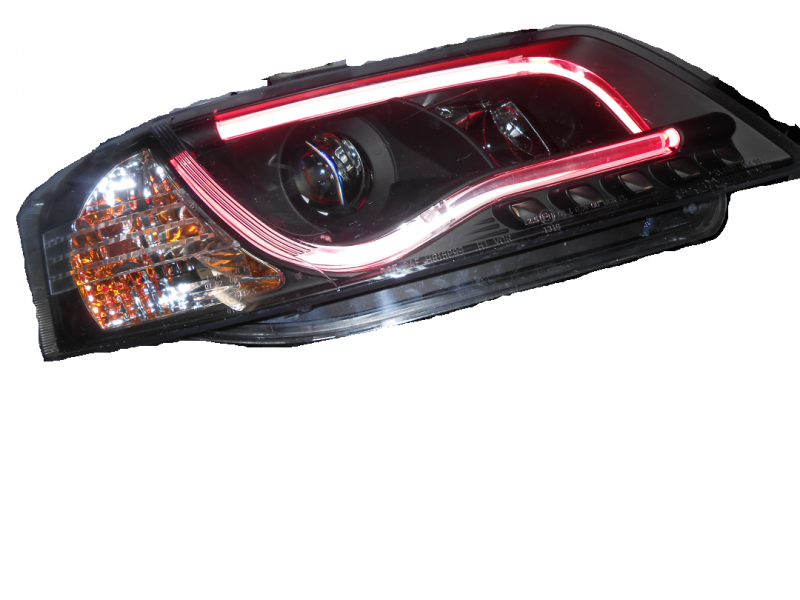 The most important thing at that set of customized headlights is that whit this system are increasing road security and other drivers observe the car approaching and the chances of an car accident is very low. Our newest project was restoring a damaged set of Audi headlights and why not? Improve the model. The set of headlights arrived to us in a bad condition, scratched and with damaged LEDs, so we just started the project by restoring its glass and changing the LEDs but we didn’t want to do a simple restoring operation so we choose to restore and customize the headlights. Starting from the idea of improving, we fitted red LEDs into the “tube” light system.